If there's one thing that high school students should learn early about college admissions, it's that all roads lead from where you would like to apply! The colleges on your list will determine what kind of GPA you should aim for, which standardized tests you need take (and what kind of score you need in order to be a competitive applicant/candidate), what kind of and how many essays you will need to write, what kind of scholarship opportunities may be available, what other application deliverables you may need to prepare, application/testing/scholarship deadlines, and more. Whether you're a freshman or a senior, it's never too early to start thinking about where you want to go to college, and how you can start building your application assets to be a competitive candidate by the time you apply. 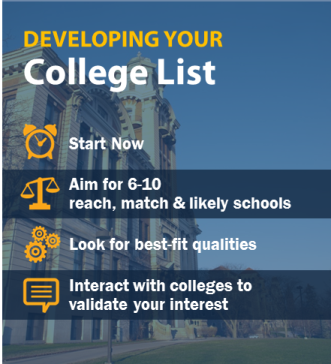 In this article we’ll discuss why it’s important to develop a working college list ASAP, and we’ll cover a four-fold framework to help you get started. When you have a goal, even if it changes over time, you'll find that it's much easier to plan your priorities. Here are just a few variables that will be impacted by where you want to apply. Of all the things college admissions officers evaluate in your application, your high school grades by far carry the most weight. It's important to earn and maintain strong grades as early as possible in your high school career, since the further you go, the harder it becomes to improve your cumulative GPA. The specific colleges you include on your college list will determine the GPA you should aim for. In terms of admissions norms, for example, the median ACT score of admitted students at University of Washington is a 27, whereas the median at Stanford is a 32. Check out The Frontier 49 College Admissions Factbook to get a sense of SAT/ACT score norms for 49 popular colleges nationwide. Do you need to complete additional preparation and raise your score to be more competitive for admissions? You'll know the answer to this question only if you have an idea of where you'd like to apply. Need to establish a baseline SAT/ACT score to know where you stand? Sign up to take a free practice SAT and ACT. You'll also want to determine which institutional scholarships are available where you want to apply. Do any of these schools participate in WUE? Many colleges award scholarships and/or discounted tuition to students who meet certain GPA and SAT/ACT score criteria. For examples, check out our The Frontier 49 College Admissions Factbook, which previews some in-state and out-of-state scholarships based in part on your SAT/ACT scores. Factor these scholarships' criteria into your SAT/ACT plans when you’re determining your target score and study strategy. For a complete walk-through of the 3-step process of choosing SAT vs. ACT, setting your target score, and determining your study strategy, download our Ultimate Guide to Designing Your SAT & ACT Prep Strategy. Many competitive colleges (or competitive programs/majors) recommend or require applicants to submit scores from SAT Subject Tests. It’s important to know as early as possible whether or not you’ll need to think about these tests so you can plan which tests to take, when to take them, and how to study. We normally recommend that students sit for SAT Subject Tests near the completion of the corresponding high school class (meaning juniors may want to consider taking SAT Subject Tests in May or June for classes they are currently taking). Learn more about SAT Subject Tests. Specialized colleges and programs may require that you submit additional application materials. For example, if you are considering applying to a U.S. service academy, you'll need to pursue an official nomination (ordinarily congressional or vice presidential). If your goal is to get recruited to play competitive college sports, you will want to start fulfilling the academic and athletic requirements as soon as possible. The earlier you start, the more advantaged you will be. Is your goal to be recruited to play college sports? Download our workshop, Pathway to Playing Collegiate Athletics. Then, check out our premium athletics advising plans. We recommend actually applying to no more than 10-12 schools; the average student completes applications for around 6-8. Make sure your final college list includes a mix of reach, match, and likely schools. Whether a school is a reach, match, or likely for you depends on how your “numbers”—your GPA, the rigor of your coursework, and your SAT/ACT/SAT Subject Test scores—stack up relative to the norms for that school. In other words, what kind of grades and test scores do admitted applicants at that school demonstrate? A college is a reach for you if your “numbers” fall below the norms for that school. You should consider all highly competitive colleges (those admitting fewer than 20% of their applicants, including all Ivy League institutions) as reach schools. You could have 4.0 GPA, be class president, and have 99th percentile SAT or ACT scores, and you still may not be admitted to a highly competitive college. One helpful way to narrow your search criteria is to brainstorm a list of what’s important to you in a college. Start with a blank piece of paper and divide it into two columns: “Must have” and “nice to have.” If something doesn’t make it onto that list, then you don’t need to worry about it when you’re evaluating colleges. Here are eight attributes that differentiate colleges to help kick off your thought process on what matters to you. Size: Big state school? Small private college? Somewhere in between? Preferences on class sizes (faculty/student ratio) and whether general education classes are taught by professors or teaching assistants? Campus Environment: Big party school? Popular athletics? Greek life? Intellectual/research atmosphere? Religious affiliation? Faculty credentials? Academic Programs: Reputation for specific academic programs you’re interested in? Undergraduate research? Internship and study abroad opportunities? Cost: Don't rule out a school with a high "sticker price" until you have weighed how much financial aid (in the form of grants, scholarships, and loans) you can receive. Retention/Graduation Rates: What percentage of freshmen return to their school for their sophomore year (retention rate)? What percentage successfully go on to graduate? Let’s take pause for a moment to consider this question: What don’t you see on the above list? Answer: Name recognition or prestige! It’s great if you’re interested in highly competitive colleges for the right reasons, but you don’t have to attend an Ivy League college to get an empowering education. Remember, your future success will, in large part, be determined not by where you go to college, but by what you do while you’re there. Visit campus when you can—and go beyond the official admissions tour: If you have the opportunity to visit a college campus in person, do it! After you finish the campus tour and speak with admissions staff, take time to walk around the campus and talk with students. Ask them what they like best about the school, what they like least, and what ultimately made them decide to attend that school. You’ll find that most students are more than willing to chat with you—and that the off-the-cuff information you hear from actual students may be more helpful to you than the story printed in the admissions brochure. If you can’t make it to a campus in person, tour it online: Many colleges publish virtual tours on their websites. Two other helpful virtual tour websites are campustours.com and youvisit.com. Participate proactively in college fairs and college visits to your high school: Both are easy opportunities to interact with admissions reps and learn more about their schools. If you're planning to speak with a rep of a college you already know you want to apply to, do your research ahead of time so you can ask specific questions that demonstrate your interest in the school. As Alaska's college admissions expert, Frontier Tutoring has many resources and services to offer students in Anchorage and the Mat-Su Valley. Already have some ideas on where you want to apply? Need help determining where you want to apply? Check out our College List Plan, which includes expert, individualized guidance on your college selection strategy, plus a list of up to 10 target colleges that you’ll develop in conjunction with our college counselor.